Dr. Patrick Cieplak, esteemed dentist and founder of Cieplak Dental Excellence, along with Dr. Charniece Whitaker, associate dentist, offer consultations with new and existing patients who want to improve the health and beauty of their smiles with non-surgical cosmetic dentistry treatment. One of the most commonly requested types of cosmetic procedures, porcelain veneers are a convenient solution that resolves multiple aesthetic conditions. The process to receive porcelain veneers involves initial preparation of the tooth surface and removal of a very small amount of enamel. After the veneers are made to match the color and shape of the natural teeth and patient’s mouth, the patient returns to a second appointment to have them carefully bonded to the teeth. Cieplak Dental Excellence has been offering trusted dental care to patients in the La Plata, MD area for over 30 years. 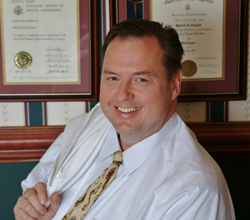 Founder, Dr. Patrick Cieplak, is dedicated to learning the latest dental techniques and has completed thousands of hours of continuing education courses. Dr. Cieplak is one of only 3,000 dentists worldwide to achieve Mastership with the Academy of General Dentistry. He is a Fellow in the International Congress of Oral Implantology as well as Associate Fellow in the American Academy of Implant Dentistry. His associate, Dr. Charniece Whitaker, is a general dentist who received her Doctor of Dental Surgery degree from the University of Maryland School of Dentistry. She strives to always develop her skills and serve her community with minimally invasive and effective techniques. To learn more about Dr. Cieplak, Dr. Whitaker, their team or the services they offer, please visit http://www.patcieplakdds.com or call 301-609-9999 to schedule an appointment.